Dawn begins 10 years after the end of Rise. A large community of primates, with Caesar as their leader, lives peacefully in Muir Woods, north of the Golden Gate. They communicate largely by sign language. The apes believe that the human race has been totally wiped out. They haven’t seen any humans in two years. However, unknown to the apes, a colony of humans has survived the plague and lives in the ruins of San Francisco. A group of humans finds its way across the Golden Gate to Muir Woods, led by an engineer named Malcolm. Malcolm is searching for a dam he remembered to be in the area, so that it can be a source of energy for the humans in San Francisco. Both humans and apes are shocked to encounter each other in the forest. Frightened, one of the humans shoots an ape. Caesar orders Malcolm and friends to leave. Caesar follows them into San Francisco and amazes all the humans with his ability to speak. He tells them he does not want war, but warns the humans to stay away from the apes. However, desperate for the dam’s power source, Malcolm, along with a few companions, returns to the forest. Malcolm believes that he can reason with Caesar, and assure him they have no desire to harm them, if they can find and harness the dam’s power. Malcolm and friends do find the dam, and power is restored across the Golden Gate. Even though Caesar and Malcolm make headway toward peaceful understanding, they are both undermined by members of their own species who question the motives of the other and want to fight. Overtaken by fear and the desire to dominate the other, both sides prepare for battle. Even though it runs a little long, Dawn is engrossing and suspenseful. The makeup and special effects are excellent. It’s impossible to detect when we’re seeing human actors in primate makeup and costume, and when we’re watching special effects. Director Matt Reeves does a good job integrating all the elements of the film. It’s fascinating to watch as the society of the apes begins to mirror that of the humans, for better and for worse. Unfortunately, the human characters are less interesting than the apes. Actor Andy Serkis, who played Caesar in Rise, returns in the role. He deserves credit for the success of the film; it’s hard to imagine anyone else playing Caesar. Serkis plays Caesar as a loving husband and father who has to make hard decisions on behalf of his species, and for the greater good. I would love to see Serkis considered for an Oscar nomination. He makes Caesar totally believable; he’s not just an actor in a gorilla suit. The final scene, a close-up of Caesar’s expressive eyes, is remarkable. 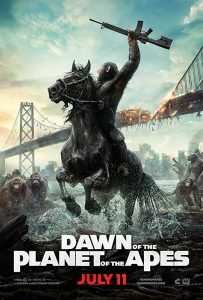 “Dawn of the Planet of the Apes” is thoughtful, entertaining and exciting summer entertainment. I suspect that, in a few years, we’ll be seeing a third Planet of the Apes film. I look forward to it. I hope it keeps to the high dramatic and technical standards of the first two in this new series.